The Women’s Empowerment in Agriculture Index (WEAI) is a ground-breaking tool to measure the empowerment, agency and inclusion of women in the agriculture sector. Launched in March 2012 by OPHI with the United States Agency for International Development (USAID) and the International Food Policy Research Institute (IFPRI), the WEAI tracks women’s engagement in agriculture in five areas: production, resources, income, leadership, and time use. Unlike any other tool, it also measures women’s empowerment relative to men within their households, providing a more robust understanding of gender dynamics within households and communities. In May 2014, the U.S. Government’s global hunger and food security initiative, Feed the Future, launched the Women’s Empowerment Global Synthesis Report. The report provides a comprehensive analysis of the WEAI baseline survey results for thirteen countries and summarises both findings from the survey and the relationships between the WEAI and various outcomes of interest to the US Government’s Feed the Future initiative. Read a blog reflecting on the WEAI’s in its first and second years here and here. Scroll down to read a number of case studies from Uganda, Bangladesh and Guatemala, watch a WEAI video, and access a number of WEAI publications. Women play a critical and potentially transformative role in agricultural growth in developing countries, but they face persistent obstacles and economic constraints limiting further inclusion in agriculture. The WEAI measures the empowerment, agency, and inclusion of women in the agriculture sector in an effort to identify ways to overcome those obstacles and constraints. 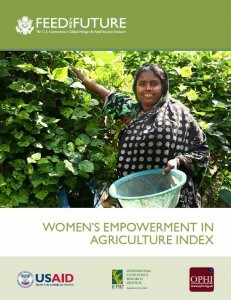 The Index is a significant innovation in its field and aims to increase understanding of the connections between women’s empowerment, food security, and agricultural growth. The WEAI is a composite measurement tool that indicates women’s control over critical parts of their lives in the household, community, and economy. It allows us to identify women who are disempowered and understand how to increase autonomy and decision-making in key domains. It is also a useful tool for tracking progress toward gender equality, which is one of the Millennium Development Goals. OPHI collaborated with USAID and the IFPRI to develop the innovative index. The WEAI was developed to track the change in women’s empowerment levels that occurs as a direct or indirect result of interventions under Feed the Future, the US government’s global hunger and food security initiative. Ultimately, the Index will be used for performance monitoring and impact evaluations of Feed the Future programs. OPHI developed the WEAI from the survey data and adapted the Alkire-Foster method, which underpins the Index. Feed the Future, through support from USAID, defined the five domains, provided technical input on the development of the pilot survey, and provided overall policy guidance for the Index, which was commissioned to support the monitoring and evaluation of their programs. 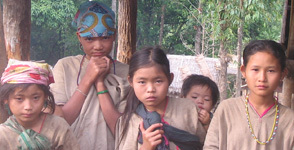 IFPRI provided overall coordination for this project, designed and implemented the household pilot survey, and developed the individual case studies, working with in-country collaborators. Watch a short film that explains why the WEAI was created, how it is constructed and the ways in which it can be used. The film includes interviews with representatives of OPHI, USAID and IFPRI, and presents the findings of the pilot studies that were conducted in Bangladesh, Guatemala and Uganda. Read the full WEAI brochure. Download the Women’s Empowerment Global Synthesis Report launched in May 2014. Download the pilot survey modules and handbook. Read a Development Horizons blog post. Read the USAID blog on the WEAI. Read the WEAI press releases. The Alkire Foster method is protected by copyright. The Women’s Empowerment in Agriculture Index (WEAI) is also protected by copyright. Under a special arrangement, the copyright for the WEAI is jointly owned by Oxford University and the International Food Policy Research Institute, and any use should be for not-for-profit only. If you are interested in using the WEAI or any of the family of Alkire Foster methods commercially, please contact the Oxford Poverty and Human Development Initiative (OPHI) at the University of Oxford to negotiate a license. Watch a short film about why the WEAI was created, how it is constructed and the ways in which it can be used. The files below were created for and during a WEAI training session held at OPHI at the end of June 2012, and explain how the WEAI is calculated.